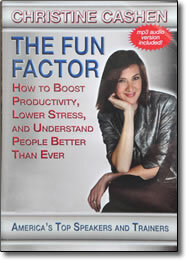 Fun Factor DVD by Christine Cashen – Free Video Clip – Discount! Study after study shows that organizations and teams that have fun on a regular basis get more done. Having more fun at work improves morale, keeps people motivated, lowers stress, and leads to a happier workplace environment. At home, the benefits are just as evident. Get ready to bring more fun into your personal and professional life, as expert speaker and motivator Christine Cashen brings you this fast-paced, entertaining program. You’ll discover keys to having more fun, ideas for managing challenging situations, tactics for lowering stress, exercises for creative thinking, methods for understanding others more effectively, and much more. Whether it’s other people who are driving you crazy, or you just need a little more fun in your own life, this program is guaranteed to add more joy to everything you do.